Hey guys? I think this is a really important series I've got planned for this week. For you and for me. Lately I've been giving some extra attention to my health and well-being to revitalize my spirit. It has been a hard year or two for me, but this year (and summer especially) I got my feet back under me and I've started feeling my heart come back to life. It's scary, difficult, exciting, and wonderful at the same time, and utterly necessary. 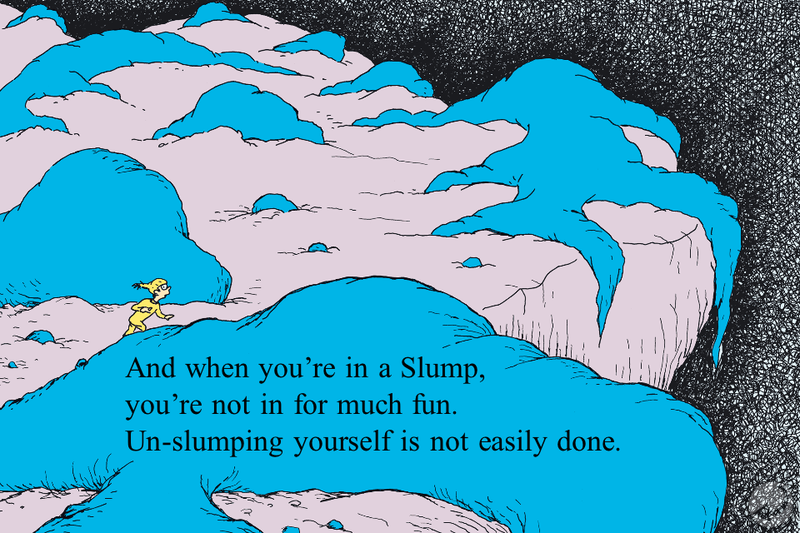 As Dr. Seuss says, "Un-slumping yourself is not easily done." But I've got some tips to share what is working for me! Starting my day with scripture immediately has changed my morning and my days for the better significantly. Reading God's word FIRST thing in the morning gives me a sense of purpose and direction for the day, something we are often searching for when we're 'slumped.' My pastor mentioned this idea first, and then I met HelloMornings online. HelloMornings are online accountability groups for morning scripture reading (and exercising and day-planning sometimes, too!). The groups check in daily online and read scripture together, share thoughts, and pray. Even though we are spread across many states, we invest in one another's lives and encourage and uplift each other. It is a great community and it has profoundly impacted me this summer. I am so stoked that the fall session starts TODAY! I'm afraid all of the fall groups are full, but keep an eye on their blog, hashtag (#hellomornings) and my Twitter (I love our conversations on Twitter, ya'll!) to follow along. You're sure to glean some wisdom. And join us in the winter session! You can also try YouVersion. It works for a ton of people but I never really got the hang of it, maybe because I don't have a tablet or smartphone. I find that starting with something online makes me all the more excited to dig into my actual Bible and physical devotional. In any case, I highly suggest a routine that starts with God's word first and foremost. It might mean getting up a bit earlier, carving out a bit of quiet time before the morning rush, but I promise you, it's worth it. When He is speaking into our lives, we're bound to feel our hearts coming back to life.